We were absolutely made up with this wonderful testimonial from Ed White following our design and installation of his garden music studio. Thanks Ed, you rock! Getting into this crazy racket, I had no children. My wife would leave the house during the day to go to her job leaving me to write music in the largest room of an otherwise silent house. It was idyllic. – additionally, writing music under deadline with children laughing/crying/both in the background has its challenges! I looked at the costs of renting dedicated production space but it all seemed disappointing in terms of the quality of the rooms being offered comparative to their relative cost. One day whilst puzzling over how to resolve my problem, I cast my eye out in to our garden and realised that we had quite a bit of unused space. I investigated the possibilities of permitted developments and quickly realised that I could build something within that framework which would meet my needs. Researching companies, I of course started with traditional garden room builders. 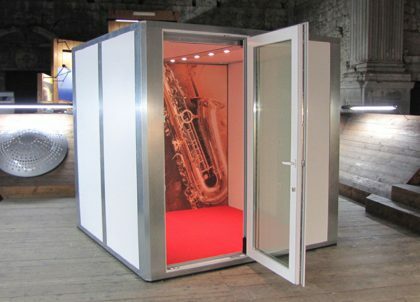 Several of these Garden Room companies have augmented their offer to include “soundproofed” options for musicians. But in discussions with them it became apparent that whilst perhaps soundproof in the loosest sense of the word, the internal acoustic of their rooms would be anything but balanced – a reverb time which is relatively uniform across all frequencies is a requirement for a serious musician or audiophile. An unbalanced acoustic wasn’t an option for me. Since my work requires me to produce surround mixes of my music which will translate to a theatre, to TV, online, stereos and car radios etc, it was imperative that I found a company who could build a room which would conform to the design limitations of the permitted development scheme, which would maintain a luxurious exterior finish AND which would provide an interior finish and acoustic which was commensurate with the highest standards found in the Oscar winning post-houses of Soho! At this point, I despaired. It didn’t seem that there was a company who could provide what I was looking for. That’s when my wife found Amadeus… and the experience has been utterly world class. A flurry of emails, designs and negotiations followed. The project has cost more than I initially set out to spend BUT each penny of overspend has yielded dividends in terms of exceeding what I thought could be achieved. And the construction has a ten year insurance backed guarantee with the Master Federation of Builders so I have peace of mind too! When the team showed up to do the work, they were a well oiled machine that grafted with single minded determination in good weather and bad, never once grumbling, never once failing to deliver five star gold-plated service. It was completely inspiring and I would be lying if I didn’t admit that my wife, the kids and I were sorry to see them go at the end. Amadeus are part of my family now. And then there has been the client after care which I must say has been similarly excellent. You can’t build a room like this without needing to tweak things… because you come to realise that it IS possible to achieve perfection… and the team at Amadeus are game for that. So you tweak until it’s perfect. They aren’t happy until you are happy which is the rarest thing in customer service these days. And the room? The room is a joy. With some tiny tweaks it sounds better than I ever imagined possible and is a lovely space to work and think in. Click here to read the original blog of Alpha Dog’s garden music studio installation.